Which U.S. State Has The Largest Amount Of Land Set Aside For Native Americans? The First Female Computer Programmers Were Called What? No U.S. state has more land set aside for Native American tribes than the state of Arizona. 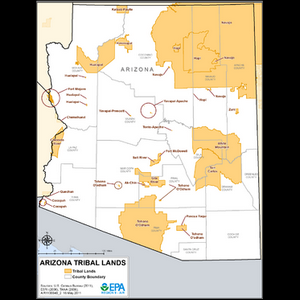 The state has 21 individual reservations, established as early as 1859 (the Gila River Indian Community created for the Pima and Maricopa tribes) to as late as 1984 (the Zuni Heaven Reservation, created for the Zuni tribe). All told, over a quarter of the land in the state, 27.1 percent, is federally protected reservation land, with several of the numerous reservations overlapping slightly into the neighboring states of California, Nevada, Utah, and New Mexico. Not only does Arizona have the most reserved land, but it also contains the largest single reservation in the United States, the Navajo Nation reserve. The reserve, established in 1868 and found in the northeast corner of the state and extending slightly into New Mexico and Utah, covers 27,413 square miles and has a population of 173,667 people. Image courtesy of the EPA.